Drag Racing Clutch Link Kits — Pro-File Snowmobile Runners - By Brad Hulings - HRP Motorsports Inc. The HRP Motorsports Clutch Link Arm Kit for Race Snowmobiles is specifically designed for 300 horse power drag sleds. This product is tested and developed on Ski Doo, Arctic Cat and Yamaha turbo drag snowmobiles. HRP Motorsports Snowmobile Clutch Link Arm Kit for 300 plus horsepower Drag Race sleds. Asphalt, Grass or Ice drag racing, this product is a must for any serious competitor. Now available for any brand of Billet Clutches. The HRP Clutch Link Arm was originally developed in 2011 for drag race sleds over 300 horsepower. Typically these machines cannot make one ¼ mile drag race without failing the belt unless they have a link arm THAT WORKS. After successful drag race use on many 500 HP Ski Doo turbo sleds we tested the long term reliability by running the Soo, MI 500 mile and Caro,MI 300 mile oval enduro races in 2012. That’s over 1000 miles of testing & racing at full throttle on rough track conditions without any failures of our Link Arm system and no blown belts. HRP Link Arms are attached to the clutches with threaded steel shaft extensions into the clutch shafts which securely attach the link arm bearings. Our design also features a unique floating bearing that self aligns and prevents side load damage to the sealed high rpm bearings. This feature allows the engine & chassis to flex in the rubber mounts as the factory designed them and also prevents vibration transfer to the chassis & rider while keeping the clutches in perfect alignment. For drag race only chassis with solid motor mounts the Link Arm eliminates the need for added braces and torque arms saving weight and reducing the torque flex in the bulkhead which can cause the machine to go sideways down the track. We have installed our Link Arm on many brands of clutches. Pictures are just some of the combinations we have done, we can install our Link Arm on almost any clutches. HRP strongly recommends Billet Aluminum clutches on any machines over 300HP for the riders safety. There are 3 key benefits of the clutch link arm kit for Drag racing sleds. Keeping the clutches in alignment stops the belt from bending lengthwise between the clutches. This is the primary cause of belt failure because the cords in the belt do not want to bend in this direction. Also less heat is generated when the belt stays straight and the belt lasts longer. The Link Arm prevents the crankshaft to counter shaft distance, AKA center distance, from coming together during hard acceleration. When the center distance gets shorter due to the engine and counter shaft trying to pull together the belt suddenly shifts to a higher gear, like shifting from 1st to 3rd gear. This results in the lazy, unresponsive feel most riders mistake as POOR BACK SHIFT. This lazy feeling cannot be tuned out with clutch parts changes without sacrificing performance and belt life. 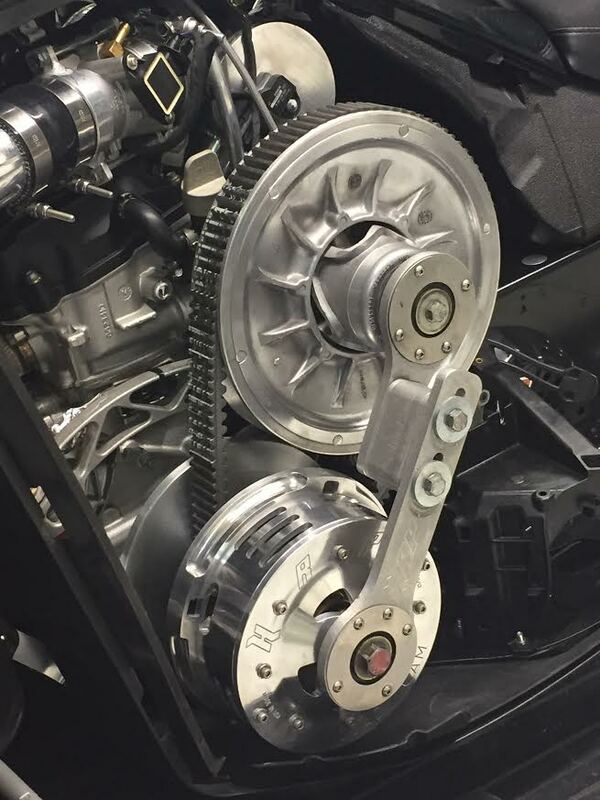 By stopping the center distance movement Our link arm prevents the sudden up shift of the belt and keeps the clutches in the correct gear all the time. This is a noticeable and measurable improvement, especially under hard acceleration in drag racing and trail riding. Both top speed and acceleration performances are greatly improved by keeping the clutches & belt in alignment. Gearing can be changed for higher top speed without sacrificing acceleration and throttle response. There are other products claiming to fix these same problems. Here are a few of the problems we have seen. Restricting the movement of the engine by adding braces at the chassis or solid engine mounts results in excessive vibration to the chassis and rider. This leads to flex & eventual fractures in the chassis and engine mounts. The rider also experiences the vibration in hands & feet which is uncomfortable when trail riding. Most importantly, the actual movement of the clutches is only slightly reduced due to the flex being moved from the engine mounts to the chassis structure so there is little performance benefit. Other link arm systems that slip on the ends of the clutches or do not have self aligning bearings wear out very fast, must be serviced often or replaced after very little use or they can come off which can result in a catastrophic failure. If it is small, simple and looks like it can flex it will. Which does not fix the problem. You get what you pay for. HRP has invested thousands of dollars & hours developing our Clutch Link Arm kit to be an effective, user friendly, long lasting and reliable solution to this problem. We have a 32 year reputation for building high quality snowmobile performance products that work as we say they will. Designing & building products that are user friendly, functional and reliable is not a cheap process. Function and reliability are the primary goals when designing HRP products for our customers, we do not sacrifice either to lower the price. We price our products accordingly, so we may continue providing the highest quality snowmobile products to our customers. This is why we are still in the snowmobile high performance business while many others have come & gone.